The Buffalo Sabres appear set to announce the signing of Joel Armia to a three-year entry-level contract. Per Capgeek, the deal is worth 925K annually with bonuses bumping it up to a 1.25M cap hit. With his NHL rights now secured, 2011 first-rounder (16th overall) is expected to play out the remaining year of his SM-Liiga contract in 2012-13 before making the North American leap the following year. Armia, who is currently in the early stages of a mandatory armed forces commitment, scored 18 goals and 38 points with Assat in 2011-12. He started slow (11 points in first 25 games) but heated up right before the World Junior Championships, where he scored five goals and seven points in seven tourney games. The hot hand carried that momentum forward, racking up 20 points (10+10) in the final 23 games before a knee injury forced an early exit after just three playoff contests. The 6'3 wing was said to have been given a Friday deadline to sign when the offer was tendered last week. 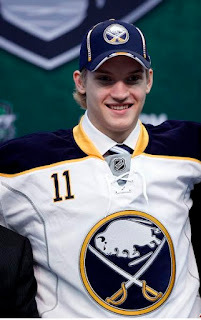 It remains to be seen whether or not he'll attend Sabres d-camp following the draft, but the masses will surely get another glimpse of the future scoring line forward over the winter at the 2013 World Junior Championship. As teammates next season what kind of influence will Michael Ryan have on Armia?